From illustrator Lindsay Hopkins and the creators of Beauty in the Bible comes a new inspirational coloring book, perfect for Bible Study or personal worship for colorists of all ages! These uplifting Scripture quotes and beautiful designs range from simple to complex, so that you can spend minutes or hours enjoying a single image. 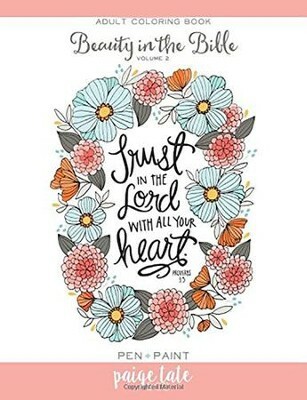 This book features encouraging Scripture quotes including "You will show me the way of life," "Trust in the Lord with all your heart," and many more. 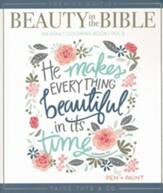 Designed to give you both peace and inspiration, Beauty in the Bible: Volume 2 offers 30 hand-drawn, calming images that allow you to focus on the beauty of Scripture and bring it to life through coloring. Vendor: Paige Tate & Co. Appealing to all ages, this coloring book is both beautiful and inspirational. 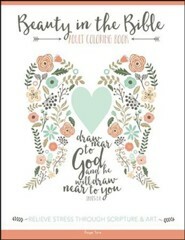 An interactive activity book that allows you to focus on the beauty of scripture and bring it to life through coloring. I'm the author/artist and I want to review Beauty in the Bible: Adult Coloring Book Volume 2.